Dr. Brad Messmer of the Moores Cancer Center at UCSD and Abreos Biosciences. Advances in biotechnology can sometimes lead to unintended consequences, such as a surge in counterfeit drugs that can be dangerous to patients. San Diego startup Abreos Biosciences is attacking this problem with novel technology that promises fast, easy-to-use tests for counterfeit drugs. 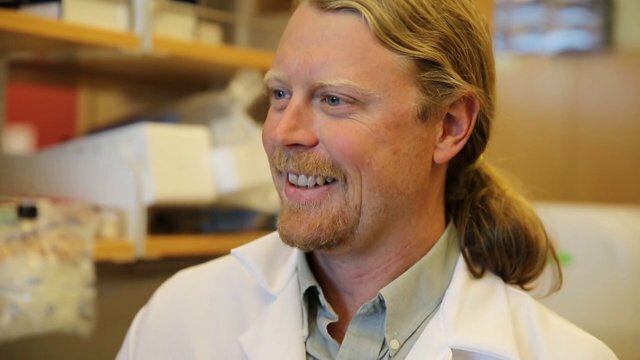 Founder Dr. Brad Messmer, a cancer biologist at the Moores Cancer Center, answered fives questions for Times of San Diego about his company and its plans. How did you start Abreos Biosciences? Abreos really began when I read an article about the discovery of counterfeit Avastin in Tennessee in 2012. Avastin is an expensive biologic drug used to treat advanced forms of cancer. In my academic work at UCSD, I had studied these types of drugs and invented the perfect agents to measure them. As we learned more about the growing worldwide problem of counterfeit biologics, we realized we had an important product and a potential commercial opportunity. We quickly wrote and received a small business grant from the National Institutes of Health and found an angel investor to launch the company. What is lab-free biologic analysis? Most of the types of tests one would do on a suspected counterfeit pharmaceutical require specialized laboratory equipment and trained personnel. The beauty of Abreos’ reagents is that they are amendable to lateral flow based assays. That’s the same technology used in over-the-counter pregnancy tests. They are cheap, rapid, easy to use, and give an answer without needing a machine or a trained operator to interpret. The counterfeit problem is most acute in the developing world, where ease and cost are critical. The ability to authenticate an expensive drug at any point, even bedside, would greatly improve patient safety. Tell us about MudPAQ and your other products. MuDPAQ is a massively parallel multiplex protein assay platform that hopes to do for protein analysis what next-generation sequencing has done for genomic analysis. It’s built on another core technology invented at UCSD. By using sequencing as an analytical readout, we can bring the cost of proteomic analysis down to the point where hundreds of proteins in hundreds of samples can be measured cheaply, accurately, and quickly. We also have several other lateral flow concepts in the works, including a test for counterfeit Botox and a test that could guide the optimal dosing of the same expensive drugs our counterfeit detection products target. There’s growing data that these very expensive drugs would benefit from personalized dosing and our technology can be easily adapted to provide a doctor the information he needs to best treat his patients, while also saving money in a critical health-care niche. Why locate in San Diego? Since our core technology comes from UCSD and the founding team was located in San Diego, our choice was obvious. But there are several aspects of the San Diego ecosystem that made our early steps possible. We have received outstanding mentorship from a variety of advisors and colleagues through the Von Liebig Entrepreneurism Center at UCSD, CONNECT, and several members of the Tech Coast Angels. One of the most important partners we have is Kestrel BioSciences, a contract research organization in Carlsbad that specializes in lateral flow assay development. In one week we were able to take our reagents and produce working prototypes at their facility. There are only a few places in the country where you can expect to find both academic and industrial partners with such ease. What’s the long-term potential for your company? Abreos Biosciences is poised to become a leading developer of novel assay platforms for biomedical, research, and authentication markets. The counterfeit drug problem is getting ready to explode as the first biologics come off patent and there are more generics, more people around the world start using these drugs, and more drugs of this expensive type are approved. People who study this problem tell us they expect that the next few years will see a tsunami of counterfeits and there are very limited tools with which to combat. Beyond counterfeits, our next generation products will significantly expand our potential markets. Our goal is to build a 21st century biotechnology company powered by innovation and integration of advances in disparate fields.